An inclinometer is an instrument for measuring angles of slope (or tilt), elevation or depression of an object with respect to gravity. It is also known as a tilt meter, tilt indicator, slope alert, slope gauge, gradient meter, gradiometer, level gauge, level meter, declinometer, and pitch & roll indicator. Inclinometers measure both inclines (positive slopes) and declines (negative slopes) using three different units of measure: degrees, percent, and topo. Accurate measurement of the degree of tilt or inclination from a horizontal position is critical for motion control systems and ensure safety during applications. Inclinometers offer an effective efficient way of monitoring spatial orientation. Oil drilling, geological drilling and coal mine drilling are the main application of inclinometers and North American is the largest electronic inclinometer market on production and consumption. This report identifies the global Inclinometer market size in for the year 2014-2016, and forecast of the same for year 2021. 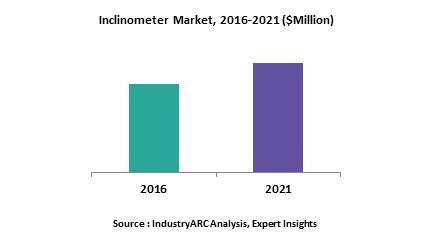 It also highlights the potential growth opportunities in the coming years, while also reviewing the market drivers, restraints, growth indicators, challenges, market dynamics, competitive landscape and other key aspects with respect to global Inclinometer market. Geographically North America is driving the market for inclinometers. Increasing industrialisation and construction activities in developing countries of Asia Pacific is estimated to drive the growth in this region. Asia-Pacific is estimated to witness the highest growth during the forecast period and North America is estimated to hold the highest share in inclinometer market.